Remember before the Ghostbusters met Slimer? They had one simple question, "What is that smell?" Well, they quickly learned who that smell belonged too, and it's the coolest glutton of a ghost ever created. That ghost is the beloved Slimer! He loves to eat food and be merry! Although you may want to be careful inviting him to any parties, he will make a mess of the place. You can be just like Slimer in the Slimer Headpiece. 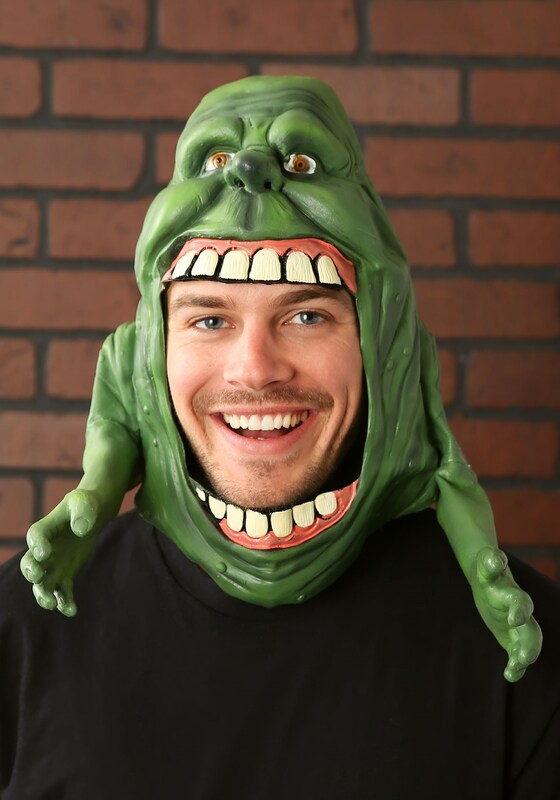 However, the Slimer headpiece does not come with his signature smell, it is 100 percent vinyl. The full green mask has cartoonish eyes, squishy arms that are attached, and a large open mouth for eating all his favorite foods. Team up with the Ghostbusters for a group costume, or go haunt the party solo. The opening where your head goes is much larger than the picture shows. Also, the piece of foam on the top inside of the mask is pretty useless. I shoved a towel inside of the back to keep the mask from flopping around. Other than that it was pretty cool looking.